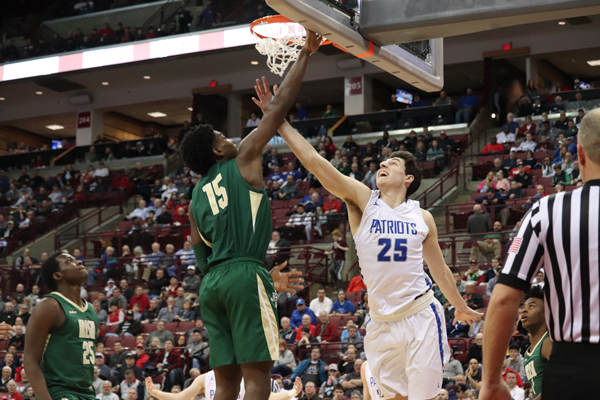 St. Vincent-St. Mary will try for their third consecutive state championship on Saturday after defeating Olentangy Liberty 58-49 on Friday night in Columbus. Liberty (24-5) was making their first appearance at the state semifinal level. One big difference this season for STVM, though: they are now playing in Division 1 after winning the last two titles in Division 2. And in top-ranked and undefeated Cincinnati Moeller, they have a mighty tough opponent standing in their way. Liberty had a 5-0 lead to start Friday’s game, but STVM came back to grab a 15-9 advantage after one quarter. In the second quarter, Liberty was unable to score for the first 6:27. STVM sophomore forward Malaki Branham gave the Irish their largest lead of the night (25-9) when he sank two free throws with 1:46 remaining in the half. Two baskets by Liberty senior forward Ben Roderick plus a three-pointer by senior guard Joey Thatcher drew the Patriots within 12 (28-16) at halftime. Liberty continued that momentum into the third quarter as STVM went into a cold spell, making only three baskets in the period. Senior forward Nick Nakasian scored on a layup with 0:06 on the clock as the Patriots reduced the gap to six points (38-32) after three. When Thatcher sank two free throws with 1:32 remaining in the game, Liberty was within three points at 52-49. But STVM responded with four free throws plus a put-back basket from senior guard Lunden McDay to close out the 58-49 win. McDay was the leading scorer for the Irish with 21 points. Liberty’s Roderick finished with 25 to top all scorers.